The beautiful Crooked River Provincial Park is located north of Prince George, British Columbia, in the Fraser River Basin. There are many popular beaches within Crooked River Provincial Park that were created thousands of years ago when the weight of the tremendous glaciers moving through the area ground the rocks and boulders into sand. 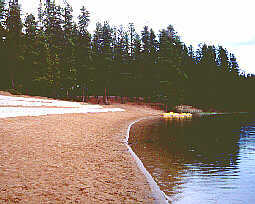 The lakes in the area are a result of the melting of these glaciers. The forest cover consists mainly of lodgepole pine, alder, birch, spruce and aspen, within which live a variety of animal and birdlife. Crooked River Provincial Park is located on the Hart Highway #97, 70 kilometres north of Prince George, British Columbia, Canada. 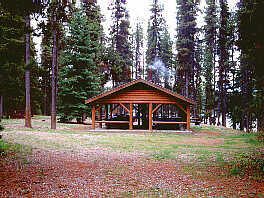 Camping - There is a 90 unit campground within the park, each containing a picnic table and fire pit. Water, firewood and toilets are provided. 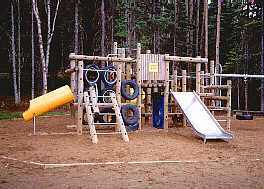 A sani-station, playground, beach, change house and picnic shelter are located near the campground. Fishing and Boating - Crooked River, Squaw Lake and Hart Lake are popular with both canoeists and anglers. Here, the avid fisherman may try his luck fishing for the rainbow trout. Power boats are not permitted within the park. The magnificent trumpeter swan visits the Crooked River during the winter months. Hiking and Trails - There are nine kilometres of trails in Crooked River Provincial Park where outdoor enthusiasts can discover the beautiful area and its abundant wildlife. It is not uncommon to encounter birds such as the bald eagle, osprey and chickadees as well as the red fox, beaver, muskrat, squirrels and chipmunks. Two kilometres away is the community of Bear Lake where food, gas, accommodation and other necessary supplies are available.